SuperCapes for SuperKids! 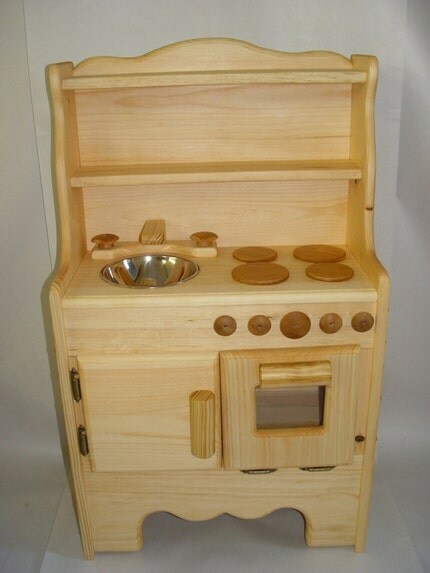 : Play Kitchens, Play Food! Max loves pretending. Just today alone he was a spy, a circus clown, a robot, a pirate, and a dentist. We've been eying play kitchens for awhile, and I've recently been tempted by the retro one at Costco which is on sale for less than $100. Then I thought, why not look on Etsy? Turns out there are some great ones on Etsy! I should've known. Really, what CAN'T you buy on Etsy?!? These are heirlooms that would be nice passed down to grandchildren. 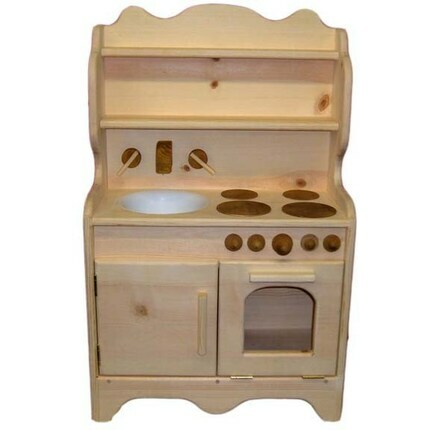 Palumba has a great assortment of handmade toys including this simple play kitchen hearth for $349.99 (that includes shipping). 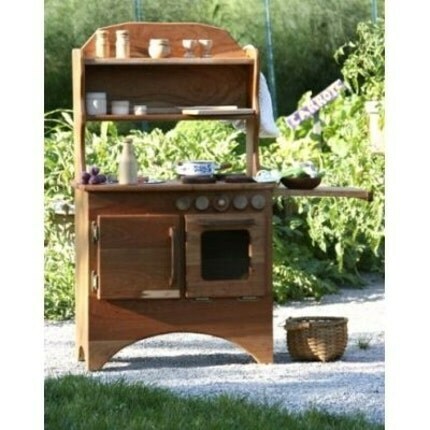 The craftsmanship is gorgous, it even has a cutting board that slides out! This one by Imagine that Woodshop is only $143.50 plus shipping. And now on to play food! There are many types that you can buy, I'm partial to felt or knit playfood myself. And it's so easy to make! 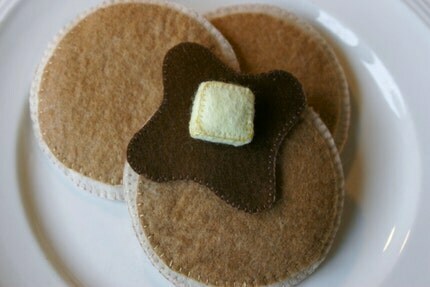 Using felt you can hand stitch or use a machine. Here is a site with lots of patterns for inspiration and some patterns, too. I just knit up a little strawberry the other day and it's so cute! 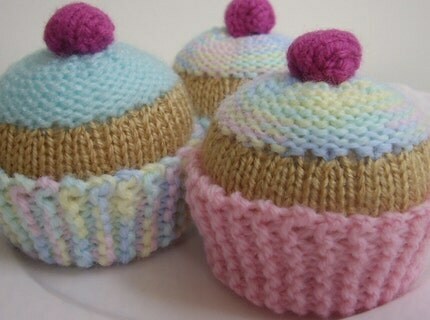 Here's a website that links to knitting patterns for everything from a banana to a cinnamon roll. Apparently you can even buy scented batting to stuff your playfood so the piece of cake really smells like cake. Yum. Bug Bites Play Food has so many cute items, it's hard to choose one! This Farmers Market produce Basket is $35. 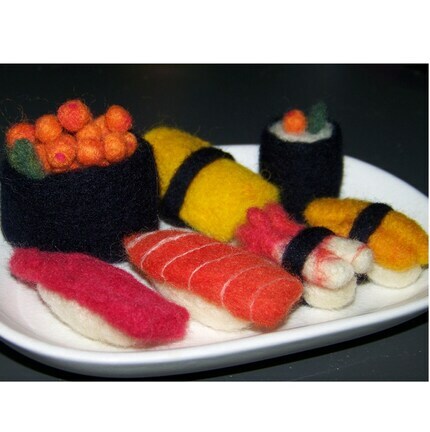 For the discerning appetite- Felted Sushi by Mango Avocado. This is a custom order and not for sale, but she does take custom orders! OUCH! Those little kitchen sets are spendy. Really cute & awesome construction. . but ouch! 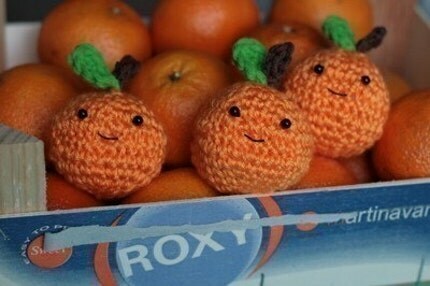 The foods are cute as well. . . I remember playing with that kind of stuff. . brings you back! what beautiful kitchen pieces. 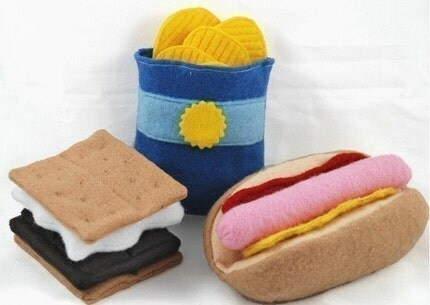 the felt food looks delicious. Not handmade (well sort of, but not much craftmanship involved). But could be a fun DIY option. Highly appreciated kitchens also the foods they are looks so yummy. I hope that you will post more and thank you for sharing.